Like many of you, I have a shiny new copy of Halo 3 begging me to skip work and abandon family. The graphics are amazing, the game play liquid smooth, the sound design without peer, and the online gaming puts the Halo franchise firmly back on top, or at least that’s what I’ve heard. 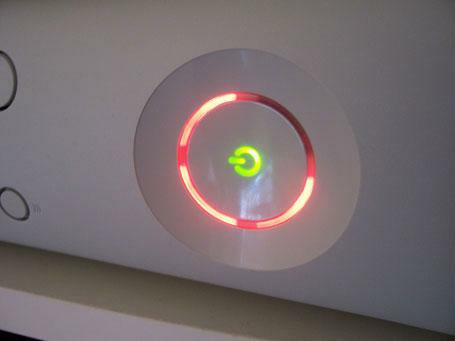 For, sad to say, my personal Xbox 360 is gone, abandoning me in my time of need. Three red flashing lights (aka la red ring of death). The sign of a general hardware failure. Ring of Death This is the last thing I wanted to see after buying a new HD tv and HD-DVD drive. @%$@! So much for high def movies or gaming. But it was still over a month until Halo 3, plenty of time to get my system fixed. Microsoft had wisely extend my original warranty from 90 days to a full year, then tacked on another 2 years for this particular problem. Wisely I say because we Americans have this thing called a class-action lawsuit and 360s have been dying a rate far beyond the norm. From my personal circle of friends, 3 out of 6 360s have failed so far. The three oldest. The other three people are not optimistic. So I called up Microsoft to get the system repaired. Mike (a supervisor) said they would mail me a prepaid box to return my console in (by ground), it would be repaired or replaced in 2-3 days once it arrived at the repair center in Texas and mailed back (by ground). I asked about a cross-shipping a replacement (many companies have this option if you are loud enough; some better companies like Dell even use it as a standard practice). Apparently it was not an option. I asked about upgrading the shipping at my cost, also a no go. So I requested that Mike email me the address to ship my system to (as to shave off one of the ground transit times). I never did receive that email. Instead I got the prepaid box off the UPS truck several days later. Fine. I packed up my console and dropped it off at my local Staples. It got to the repair center on the 31st of August.